Fact: IRS officials are employed by the US Government (representing us) to administrate tax collection. Fact: When they are caught and accused of violating our laws when performing their jobs we are told they have to be investigated. Fact: When allowed (by our Justice Dept.) to investigate themselves (IRS), they are not being paid to administrate tax collection. Fact: Self-investigation, by definition, is subjective and therefore cannot be objective, which negates the impartial ‘blind-eye’ of justice. This MOT Ballot collectively weighs the following thefts: The first theft is by the President by collecting a salary and the panoplies of power for unnecessary activity and non-existent work. The second theft is the Justice Department collecting a salary for not doing their job of investigating in the Constitutionally contracted areas of their responsibilities. 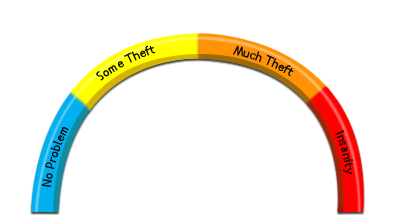 The third theft is stealing from the public time and attention by the insulting proposition that someone left to investigate themselves will result in taking full responsibility but without penalty or loss of job, or judging themselves guilty without forfeiture of benefits. Even if guilty it is tantamount to saying, “I take full responsibility for this crime… Okay, now on to the price of hog-bellies in Kansas and fund-raisers.” This MOT Poll Ballot weighs the theft by this Administration's IRS of their salaries by not doing their job of accounting for tax returns, but instead having to account for their own non-compliance with US Constitutional laws.